Adzagli /Jungle Funk (Kofi Ayivor) was originally released as a vinyl EP in a limited edition in 1982 in the Netherlands which Kofi recorded in 1979 at the then state of the art 24 track Island Studios in London The original track is an example of what Kofi himself jocularly referred to as “disco boogie”. 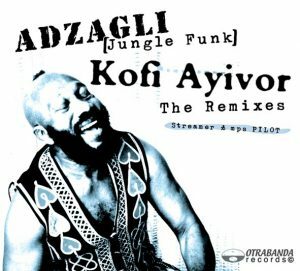 The digitally remastered Adzagli (Jungle Funk) was taken from the album Rhythmology (Otrabanda Records OTB06) that collects many rare or previously unreleased tracks of Kofi Ayivor’s own compositions as well as a cross-section of the incredible variety of genres to which he has lent his unique drumming talent. Remixers Streamer and mps PILOT brush up the old tune and juggle with the multi-track master of vintage (afro-sound) which Otrabanda Records provided them. Streamer is the studio project of producer Gary Shepherd, an Englishman living in Amsterdam. Also well-known as his DJ alter ego Alec Smart, in other guises he’s made his mark on the mash-up scene, in the world of cutting-edge theatre performance and film sound tracking. He’s one of the few artists who manages to combine underground credibility with up-to-the-minute style. And don’t forget the otherwise so much missed irony factor. “It’s got to be fun. Period.” he explains. It’s got to be funk, we add after hearing the music. Streamer has two albums credited to his name. His debut album Blissed became a lounge classic and was extensively licensed to the compilations like 2ManyDJs, Hotel Costes and New Testament of Funk. Streamer’s new album Under A Spell has just been released, and his label KidNap Records published a remix project for the albums’ hottest tunes with people like Jimpster and Dublex Inc.
DJ MPS Pilot produces a refined, yet hip mix of non-Western music and is currently renowned far beyond his Amsterdam home base. His regular gigs include resident stints at the famous Amsterdam Paradiso and Melkweg venues and the prominent annual Flemish Sfinks Festival of world music. His eclectic spinning style brought him deep into the Sahara in Mali, where he twice performed at the Festival in the Desert. Other sojourns include performances at the Jaipur Festival in Rajasthan and the Timitar Festival in Morocco. MPS Pilot weaves drum n’ bass rhythms, flamenco palmas, Indian bhangra- or Desi beats, Afro-grooves and Latin percussion solos into an organic whole. His intelligent and rhythmic use of mixing techniques makes the music function as a mind opener. MPS Pilot has now launched into producing and remixing songs. Whether blending or juxtaposing traditional and urban sounds from anywhere on the map, mps Pilot is always out there, challenging your mind and moving your soul.